It was an unusual ending to a great game. As a matter of fact, it was apparently the first time a Major League Baseball World Series game had ended with an obstruction call. Not too hard to believe since that situation seldom arises at that level of play. And when it occurs, the basic application of Rule 7.06 requires that the runner be awarded the base he would have reached if, in the umpire’s judgment, there had been no obstruction. 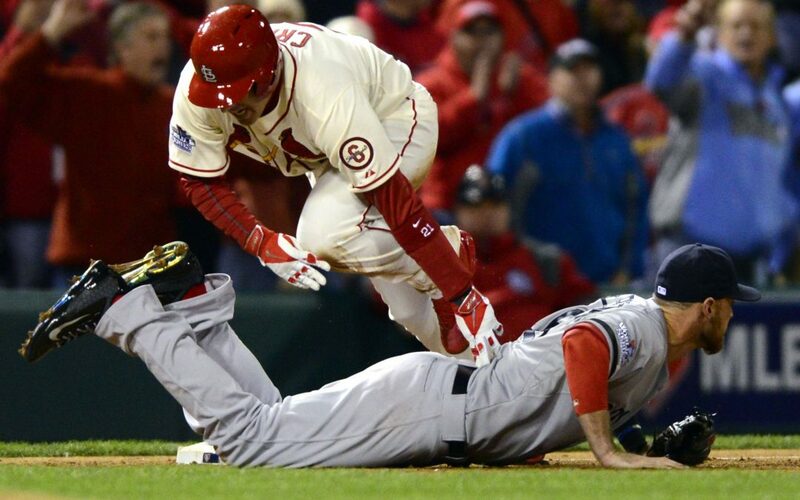 In the bottom of the ninth inning of game three of the 2013 World Series, with the score knotted at 4 to 4, the Boston Red Sox catcher Jarrod Saltalmacchia threw wide of third baseman Will Middlebrooks, in an attempt to throw out St. Louis Cardinals’ runner Allen Craig, who was trying to advance from second base to third base. While the ball rolled past third base into the left field foul area, Craig attempted to get up and run to home plate to score what would be the game-winning run. Instead it appeared he was tripped by the raised leg of Red Sox third-baseman Middlebrooks who was lying face down at third base. Third base umpire Jim Joyce immediately raised his arm signaling obstruction by Middlebrooks, followed by home plate umpire Dana DeMuth signaling Allen Craig was entitled to score at home. It was the winning run, and game three ended on an obstruction call. The call was correct, and as a result, the St. Louis Cardinals won that game three of the 2013 World Series to take a 2 games to 1 advantage over Boston. Holliday’s refused to take the bait, and his response simply pointed to the rule. “It’s part of the game,” he responded. The rule, one of many which are the foundational elements established for the integrity of the game. The rules. The truth. Ms. Andrews’ question, seemingly seeking to stir controversy, casts an interesting perspective on what seems to be a move in society away from absolute truth. When should truth prevail? When should the rules apply? Always, or only when it seems fair? What about in life? Should the rules always apply—should truth apply—always, or only when right for me? Or when right for our children? Or maybe the rules should apply only when the result is fair by popular consensus? That is—should we take a poll? When should the rule apply, or the rule of law apply in our country? Does Erin’s question suggest that maybe a rule should not be applied if it results in the end of the game? And even then it might be suggested that maybe it should be applied only if it “seems” fair at the end of the game? The list could go on and on, as we push the envelope away from the absolute truth, away from the rules, and the rule of law, to make exceptions for circumstances based upon our feelings or to arrive some consensus of fairness. Absolute truth is the basis for all decisions. Or it should be. Absolute truth recognizes the supernatural aspect of our existence in this world. It recognizes that things are right and wrong based upon what God says is right and wrong. And also the rules and law which God ordains us to establish for the good of the order. Without an absolute basis—an absolute polestar—for decisions between right and wrong, truth becomes relative, and dependent upon the situation, on the inning, dependent on whether its application seems fair or not, or seems fair in the midst of changing cultural patterns. It was just an obstruction of the base runner by the infielder which ended game three of the 2013 World Series. And it may be that Ms. Andrews didn’t even realize what her comments could be construed to suggest. After all, it was a seldom-used rule. But it was a rule. That led to a right result. And it was the truth, absolutely. The umpires got it right. Will we? The future will tell. Just something for us to think about as the 2018 World Series, and life continues.